Can anyone help with the history of AH Comben’s Nosila, built by HB Hornby? This seems to be a week for folks appealing for information – but that’s just fine with us here at Intheboatshed.net Towers. In fact, behind the scenes we seem to be making progress in discovering more of the story of Gadfly II and I hope to be able to report on that shortly. In the mean time, I’ve received the following message from Kyle Abingdon, who is working in the yard alongside with Simon Papendick. ‘I too am restoring a wooden boat at the same yard as Simon. Nosila is a carvel-built Bermudan cutter, of 35 x 9.6 x 4.4ft. She was designed by AH Comben and built by HB Hornby in Wallasey in 1946. ‘The question I have is this: does anybody else have a Comben or Hornby boat – for if so I would love to see it. Apparently HB Hornby built lifeboats during the WW2, and as Nosila is very heavily built this may make sense. ‘But my reasearch on both these men and their boats has revealed only one other boat, Schalime II, which was built in 1939 and is listed in the National Historic Ships Register at http://nationalhistoricships.org.uk/index.cfm/event/getVessel/vref/1945 . ‘I enclose some pictures. The wheelhouse was added in the 1990s. Thanks Kyle! If anyone knows any more about this boat, or indeed any Hornby boat, please let us know through the Comment link below, or email me at gmatkin@gmail.com. Also if you happen to know more about Schalime II, there’s an appeal for information on the NHSR page too. PS Kyle reports today (Feb 4th) that he’s discovered that Wirral Council has some archive material about the Hornby company. I was interested to see the article about Hornby's and Arthur H. Comben. There was an article about A.H.Comben in Classic Boat no.121( June 1998) written by Tim Booth who is related, I think, to either Comben or the Hornby family. There is also material about Hornby in the Merseyside Maritime Museum collection and it would be worth contacting them. Finally, Dickinson was famous as a builder of racing yachts in the 1870's, building boats designed by both St.Clare Byrne and Alexander Richardson. Dickinson appears to have taken over the yard from J.Bishop who built a number of yachts in the 1850's many of which were of the American sloop type, which were popular on the Mersey at that time. I saw this and contacted Kyle. AHC was my grandfather so I have a lot of his drawings and list of designs – cannot believe 1946 though, no timber for pleasure craft after the War. Will find her. Hi Brian – see you in Beaumaris in the summer I guess! By the way, there's a 16-foot aux sloop called Firebird in Norfolk, a Mersey cutter called Zerobe on the Ijsselmeer in Holland, and a TS cruiser called Derson on the Severn. All by Comben. Probably a few more still roaming around too. Further to Tim Booth's comments, my Lloyd's Yacht Register of 1948 tells me that Nosila was indeed built in 1946 for George S.White of Chippenham, Wilts., a member of the Parkstone Yacht Club. It's quite possible that she was started before the war but not completed until afterwards. Comben is credited with 37 designs of yachts in the register. My previous comment about Dickinson and Bishop does not make sense unless you also know that Hornby succeeded Dickinson. Not sure that we'll make Beaumaris this year, Tim. I am restoring a 1930 motor yacht called MATOYA designed by AH COMBEN. Matoya is one of the Dunkirk Litle Ships. I noticed a reply by TIM BOOTH to a query for another AH COMBEN yacht. If tim booth sees this would he contact me as we know of a number of boats designed by him, and would appreciate any information that he has on his Grandfather. I was told by an ex colleague at Liverpool Museum who lives in Wallasey that craft were taken from the yard to the West Float in Birkenhead by trolley. From there boats could be craned onto the water or loaded as rail freight. Having seen where the yard was, I do not find this surprising. Hornby's also made, what were called locally, gig boats used for line handling etc in the docks on both sides of the Mersey. I would be interested to discuss with Tim Booth his grandfather's designs. Whilst this afternoon looking through the Hornby archive at Wirral I noticed that there is a photo of Nosila in the Hornby yard (Acc.No 1833 ZHH 1/67) and even more serendipitous, in a recently catalogued batch of drawings, her rigging and sale plans along with two other sketches. The archive's numbers are 1/33 for the rigging and 1/34 for the sail plan. The yard number for this craft, if the Hornby numbers are to be believed is 35/387 which means she may well have been planned and built before the Second World War. The drawings are obviously by AH Comben, his style is unmistakable with drawings by others in this collection standing out like sore thumbs. To all those requesting details/history of 'Schalime 11'. 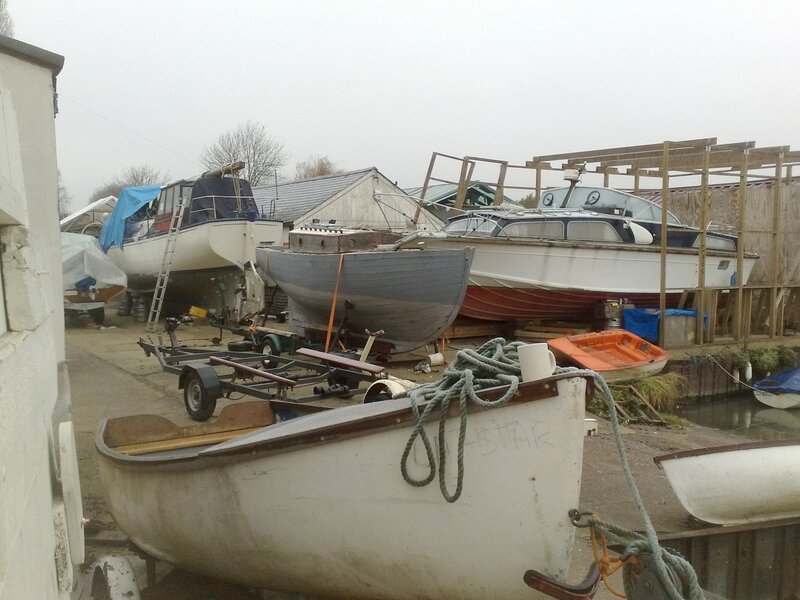 I am the current owner, refitting her at Fambridge Yacht Haven in Essex. My sister is currently researching her history and have had contact with the Hornby family, who are graciously assisting the research. Wirral archives have been contacted and kindly are also assisting in the compilation. Thus far I am in possession with early photographs together with details concerning her original owner and of the full interior furnishings. Eventually I intend to raise funding for a complete to original specification as far as is practicable, and will report details here when my research is complete and documented. I am happy to show interested parties around the yacht if I am contacted. june 27th. 2012 does anyone know that INTERLUDE built by hornby and desigind by A H Comben is still on the norfolk broadsnot now in good condition, but savable she was specially designed for use on the isle of anglesey in 1938. may try to get in touch with liverpool maritime museum and see if anyoneis interested in her. she was the subject of a write up in 1938 boat papers due to her design and speed. I am the owner of INTERLUDE she was saved from being destroyed two years ago and now resides in Taylors Boatyard in Chester. gained from the National Archive. Any information, plans, drawings and photographs would be very greatfully appreciated, as I intend to restore her. Any one whose concerned I have just spent two days at the national archive in the Wirral, going through drawings to see if they had any drawings on my boat designed by A.H Comben build by James Husk of Wivenhoe the boat name is MATOYA. Unable to find drawings for my boat as there are so many drawings there, I did not have enough time to go through them all I saw photograghs of INTERLUDE and believe some line drawings of her were there. 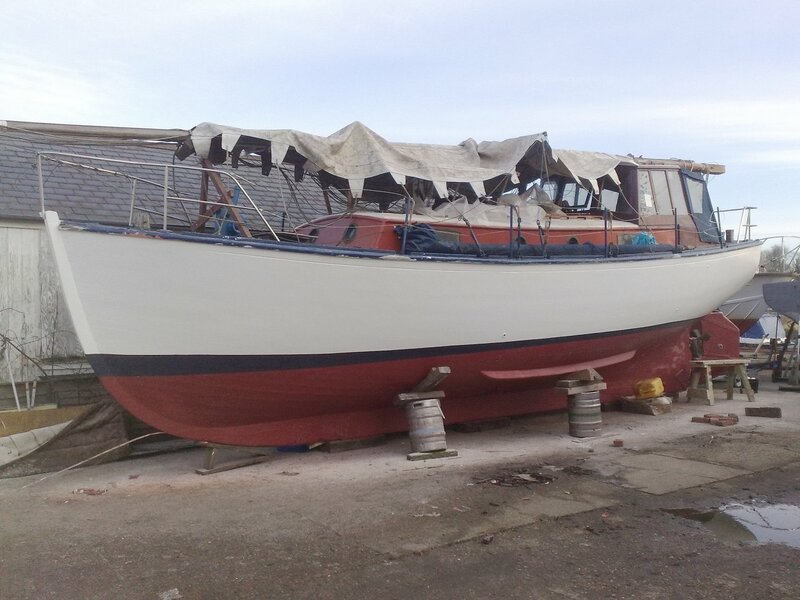 Could the owner of GADFLY II tell me who built her as I am drawing up a list of boats that were designed by A.H. Comben but built by other yards due to their size. I belive the line drawings of Schalime II are held at the Wirral Dr. No. 40/413. I have 6 owners of Schalime II from when she was built to the 1980. Does any one else have details of any of the Comben boats. The two email addresses I have for Tim Booth do not work. Does anyone know his correct one? Hi John – I’ve forwarded your email addres to Tim. Thanks Gavin, he and I were in contact some time ago. I own Gypsy built by Hornby 1936 a 28ft6 weekend cruiser. Can anyone help me with her history.? Not wishing, or able, to take Phil Booth’s place I’ve waited to reply until now. Phil kindly gave me copies of his grandfather’s records to help with research into the drawings. Gypsy had yard no 393, was completed 31/8/36, was made for Mr Lester and was fitted with Morris (engines). A cross check with the drawing list appears to show Mr Lester had the given name “Wm”, her dimensions are given as 28′ 6″ x 7′ 9″ x 2″ 9′ and she is described as a T.S cabin cruiser. As yet I have no idea if the drawings survive. Many thanks John for your help. Any information is much appreciated. The archives where very helpful in Liverpool. If you, or any one else have any other information regarding the history of Gypsy please contact me at d.pannell@hotmail.co.uk as I have lost track of sites I’ve asked for help on”!! Hence the very late reply. So apologies for this. To Raymond Hinds, or anyone able to alert him, I would advise you that I have several items pertaining to MY Matoya in my possession that will be of interest. All items from the period 1936-39. If Raymond would email me at [email address supplied] to establish contact, I will then reply direct with a list. Gerald – I’ve emailed your message to him. Very interesting to read about HB Hornby’s as I worked in the yard as an apprentice boat builder 1955-1961, the boats we were building at that time were motor launches and surf boats for West Africa, pilot, survey launches and diving boats for the dock board, I remember a yacht by the name of Darthula but I can’t remember when it was built. Last year I gave all my boat building tools to an Norwegian carpenter who visited Wallasey in a Viking boat, the crew fitted a new mast having lost there’s in the Shetlands area. Seems so long ago now. If anyone has sent information regarding my othet half David Pannell’s 1936 Hornby weekend cruiser ‘Gypsy’ please can you forward yr emails to me at Mbird38@gmail.com as i didnt know he’d put his emsil address as he rarely ever checks it and when I looked the other day for him, thete were over 2000 emails l, so when I’ve time Ive got to trawl through these deleting rubbish to find any informative ones. We’ve seen a picture of her in frkmt of one of the historic ships at the Portsmouth Heritage dockyard museum bur wd really love to find out confirmation of whether she was used in Dunkirk. We know she was originally commissioned by an Admiral and had a steel bulkhead instead of a wooden one and had 2x vosper Thorneycroft engines installed in the 50’s, was owned by the Spragg family on Hayling Island but was stolen in 1968 as part of the getaway for the Great Train Robbery as we understand it. She was found again. She was rammed by customs at some point when used drug running and was part of an Interpol investigation whrn a Michael Stiff of Blemheim Road, Ipswich found her abandoned on a river. As the Spragg family had been paid out on their insurance, they didnt want her back, so Michael Stiff was allowed to claim possession of her, which is who Dave bought her from. We have an article from the Daily Express that he sent us from July 1971 as he was about to embark on a trip to Scandinavia in her and it states the Interpol investigation was still open as to the mystery of where she’d been for 3 years. Un fortunately, Mr Stiff died not long after we bought Gypsy as he had lots more info and iyems from her that he was going to give us. We didn’t like to call his number initially as realised his family were grieving. A friend of his contacted Dave to let him know the situation and he was going to let the family know that Michael had intended to give Dave the rest of the items he’d stored off of the boat as she’d been sat for 25 years by now and hsd been broken into, took on water and was half drowned when Dave found her. All the oul had come out the engines but that had helped preserve everything. Unfortunately Dave broke his phone, lost all his numbers and we never heard back from anyone. So…. Dave painstakingly cleared inches of oil and gunk from inside her and she’s starting to look great but still a long way off completion plus need to find a couple of brass portholes that were robbed off her. Have you got news for us? Classic Sailor is a new magazine about traditional and classic boats from ex-Classic Boat editor Dan Houston and colleagues that promises rather more coverage of the traditional craft around our coast. I think we should wish them well... Find out more here.